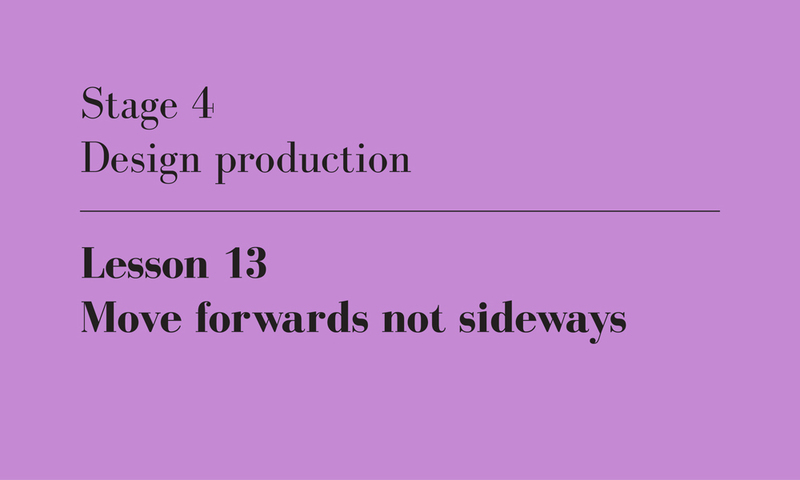 This is the 13th of twenty-one lessons for design students, gathered from the combined experience of being a student, and teaching students. I will published one lesson each weekday until they’re done. Maintaining productivity throughout the semester is one of the most important challenges you’ll face in your design studio. Even though the start and the end points of your project are quite easily defined, the 12 weeks in between are a fog of non-linear sequences, dead-ends, debate and revisions. You need to churn through a huge volume of work, without even the courtesy of a prescribed workflow to follow. Productivity is the essential ingredient here, which is not about working lots, but working well. Like a shark, you need to keep moving forwards or you’ll drown. It’s easy for me to tell when one of my students is stagnating (and I tell her so), but I suspect that discerning the difference yourself is less so. You’re staying up each night until 2am so you think you’re being productive, but actually you’re just busy panning, zooming and working out which music to listen to. Despite one implying much greater velocity than the other, both options relied on forwards movement. Unfortunately, this student picked a third option and, from approximately week 3 to week 9, moved sideways not forwards. Week after week, she would bring me beautiful models that examined different versions of her building. But what soon became crystal clear to me, yet remained totally opaque to her, was that they were really just many different solutions for the same problem. She wasn’t advancing at all, she was drifting. If the scale of your drawings stay the same, then you’re moving sideways. If you’re reducing their scale, then you’re moving forwards. In other words, remaining forever at 1:50 means you can only ever examine things that make sense at 1:50. You can’t look at the masterplan of your site, because it would fill an entire room with paper. Neither can you look at a detail, because it would need a microscope to be visible. In contrast, progressing from 1:500 to 1:50 to 1:5 is a discipline that demands you increase the detail in your project. Each jump in scale reveals different problems and forces you to find solutions for them. What was so tiny as to be insignificant in your 1:500 masterplan becomes glaringly obvious in your 1:50 section. What was a small blank spot in your 1:50 section becomes embarrassingly large in your 1:5 detail. My apologies, dear reader, for missing my daily deadline yesterday. With effort and luck, I’ll stick to my promised output for the rest of this series. This can only happen on paper (or in a physical model), not on the computer screen. The digital environment has only one scale: 1:1. When you draw at 1:1, it’s impossible to tell whether any particular drawing is resolved or not until you print it out at its intended scale. If it’s unresolved, the drawing will be empty. If it’s over-resolved, it will be cluttered. Move forwards not sideways, author’s own image.